There's been a lot of chatter this year about the decline in the larger beer market — a few slow percentages consistently dripping like a leaky faucet in an anxious rhythm that's keeping some people awake at night, and for good reason. For anyone in big beer watching wine and spirits come in a steal market share in gulps, there's the growing feeling that there's one too many games being played simultaneously for an industry that's long lost it's ability to adapt and be nimble. Big beer's been in "protect" mode for quite some time. But suddenly the landscape is full of new animals built more efficiently and with an unprecedented cunning, and the industry is starting to write big beer off as the wooly mammoth that just can't find enough to eat. Compare the industry's slow decline with the double-digit rise of craft beer and it becomes clear that one industry's losses are another's gain. Were these new brewers to be competing on beer terms, the shift might seem temporal, or a bubble might be rising in our midst. But to see craft beer as part of the larger beer industry alone is to misunderstand its attraction, and ultimately, it's position. As Alan Newman once told me, craft beer isn't an industry alone — "it's part of the expansion of the American palate." With that in mind, it's more interesting to see craft beer as part of a different, perhaps decentralized industry that's cutting across categories. The term: "industry" in and of itself, implies a centralized state of affairs, with the rules of the game clearly outlined, and the competition head-to-head. But so many of our traditional industries are no longer recognizable as such. Is Square part of the financial sector? Or is it stretching across mobile payments, small business development and reframing the cash economy? Is something as simple as Instagram part of the imaging industry like Kodak was? Kodak thought so. While Instagram certainly creates images, it's also partly a social, brand and e-commerce platform. It reminds me of how my wife complains that everyone in the Big Ten thinks Michigan is their rival, while the truth is "we don't care about any of them, only Ohio State is a rival in our eyes." If the people you're trying to compete against aren't even paying you attention, it's a clear sign that they're playing a different game, and it pays to know what game you're in. So as big beer fights battles on multiple fronts, including wine and spirits, craft beer spreads itself across many channels, occasions and types of "craft" products, stealing share from multiple categories at once. And in many cases, by working right alongtside them, positioning themselves as part of the broader expansion of the American palate. It's not that Americans want more wine, or more beer, or more spirits for any particular reason. Americans are looking for flavor, and sophistication, and something to care about with their friends and alongside their food, which has already undergone a similar craft renaissance in the last ten years or more. No one seems to understand that perspective better than the people at Wirtz Beverage Group in Illinois. They've been growing their distribution business around the country, and right here in Illinois, by focusing on the brands and products that people really love. Until recently that was exclusively wines and spirits. They built an enormous, highly influential sales and logistics force that could service any account in the state from a single location right here in Chicago, and their sprawling warehouse in Cicero. But they've also started building the brands they serve, creating awareness where there was none, helping accounts (bars, restaurants and other places of leisure) learn about the product, its unique history and qualities, and ultimately position the product for success. They don't just roll trucks — they become ambassadors. So when Wirtz announced they were taking on their first craft beer account in Illinois, it came as a surprise to many in the industry. And almost every move they've made since continues to surprise. But one person who wasn't surprised at all, was Danny Wirtz, whose father and grandfather have owned and run Wirtz Beverage as a family business since day one. Danny is leading the company in new directions, focused on growth and it's his unique background in brand building that helps him see the opportunities that few others are even looking for. He's the one that wasn't interested in sitting back while wine and spirits grew. And he wasn't looking at beer as the enemy. Instead, he looked at the world of craft beer and saw something he liked — passionate producers and equally as passionate consumers clamoring for more. To that end, Wirtz took the largest cooler in the country devoted to wine and cut it in half. They built a wall at the cost of $100,000 in order to control a five degree temperature difference, sectioning off 25,000 sq. 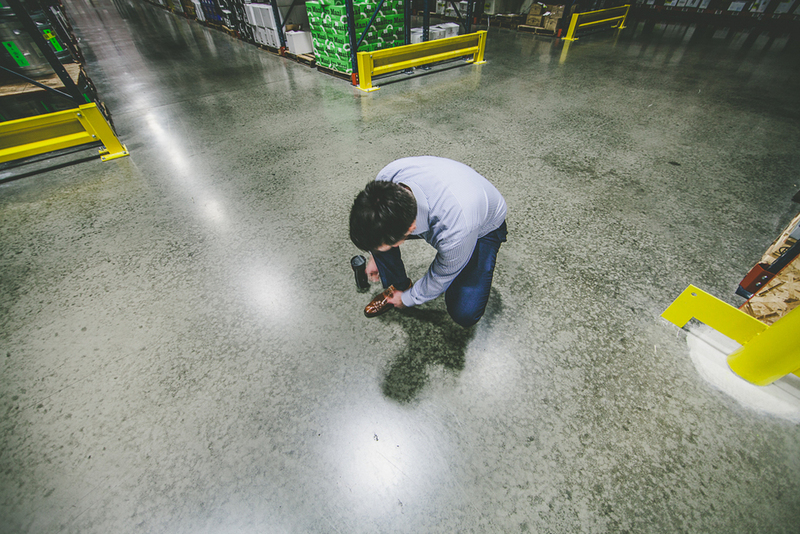 feet (375,000 cubic feet) devoted solely to craft beer. And for now, a few small stacks of kegs sit at the South end, waiting for some industry friends to arrive. Danny didn't just walk into the family business, which also includes the Chicago Blackhawks, Bulls and the original owners of Chicago Stadium among other well-known assets. After school, he struck out on his own a bit first, went to New York City and followed his own passion — music. "I went to Boston College and I was really into music and I was interning at record labels over the summer. I was a college rep for bands. I was very intent on not coming back to Chicago. I was going to live and work in LA or New York and work in the music industry. I had come back the summer before and was selling shoes at John Fluevog in Wicker Park , and by the end I was faxing resumes to record labels in New York and then I realized, if I'm going to go do this, then I just need to move there. So I went out, slept on a friend's couch and hunted. While this may seem completely normal, looking back it was a really humbling thing. There were no family connections in New York, or in the music industry. There was no Wirtz name. In New York, I was just another 20 year old looking for a job in music, and there were a lot of those. Danny ended up at Fader, a magazine and radio promotions company, which had just started doing some consulting work for brands like Sprite who wanted a hip-hop marketing platform. He was there during the early stages of Microsoft Xbox's music offering, and when brands like Nike, Converse and other streetwear apparel wanted to explore digital lifestyle marketing. "It was then that I started understanding the brand component. I got to work with Apple and Nike when they were working on the Nike+ project, some of the early music consulting pieces of that. I got a real feel for the rock and hip-hop influencers and how to work with them, how to get product to them and work with them to build the brand, to build that awareness." After New York, Danny went to London to continue doing brand agency work and experiences for brands like Motorola. He'd help set up exhibitions for products like the Pebl phone, developing the marketing and communications. And it was there that he was first exposed to alcohol and beverage clients such as Red Stripe, Smirnoff and Johnnie Walker. "It was funny to be in this branding world, and here I was working on brands that we sold in the family business back in Chicago. For the first time I could pick up the phone with my dad talk about it, and that's when we had a relatable moment where it wasn't just some weird music thing I was doing, it was actually something we could talk about." The difference between Danny and his father couldn't be more apparent than in the aesthetic choices in their offices. Where his father's space feels quiet, thoughtful and rich in heritage, Danny's is energetic, spartan and somewhat irreverent, expressing a connection to the cultural influences that motivate Danny to be creative and adapt. While there was never a plan to return to Chicago, and the family never pressured him to join the family business, eventually Danny found his way back. "As I was getting older, Chicago started calling me back. New York really runs you down. Me and my wife started thinking about having a family, and my grandfather had just passed away. So there was some pull. After talking to my father, there was also a real role in our Diagio selling division as a brand manager focusing on the reserve, or luxury brands. It was all about specialization and influencers, all the kinds of things I was doing. It was very serendipitous. So I packed up the apartment in New York, came home for the funeral and started working in the business right away. It all happened so fast." Things were a little different than the fast-paced creative enterprises Danny had been working in until then. This was at its heart a logistics company, and when you build a brand through distribution, it's a ground-up relationship effort, not top-down creative. "The next thing I know I'm in a windowless office in Woodale, Illinois. I'm now the luxury brand manager, and the first thing they did was get me out on the street to visit some liquor stores. And I'm realizing that this is much more on-the-ground — this is the end of the brand building process. How is this brand sitting on the shelf in a liquor store in Antioch? All the creative in the world has to move this thing off the shelf right here. So I saw this opportunity in a very tactical, front-lines distributor aspect of the brand." "If you walk into a pub in rural Illinois and you see a Deschutes tap handle, we were able to place that there, and you know it came from us. And if you saw a huge display at Jewel or Binny's, were were able to do that too. There's the servicing component from inventory, to rolling a truck, to the account often within 24 hours of when the order was placed. And the other component is the sales and marketing piece, as a consultive sales force on the street, going in and building brands. We have the luxury of selling huge brands that are regular items for lots of accounts — Jack Daniels, Smirnoff, Bicardi rum — these are brands that people simply have to have. They're staples. And then we have a whole set of brands that are developmental. These really great gems that are more about hand-selecting the right accounts, targeting the right people to make sure these brands are in the right places. And when you want to know how your beer is doing in Illinois, you can just pick up the phone and get an answer rather than having to coordinate an effort across any number of distributors each with their own reporting structures." On a bleak Wednesday morning in Cicero, a small team from Wirtz and Deschutes gathered in one of the presentation and training rooms in the center of the building between the warehouse and corporate offices. Former Fountainhead Beer Director, and newly hired Wirtz Craft Beer specialist, Phil Kuhl, turned tap handles until they tightened and placed Deschutes brand labels into their lighted frames. Industry leaders, Mirror Pond and Black Butte shown out, alongside newcomers Chainbreaker, Hop Henge and Red Chair. And at the end of the line stood Abyss. At 10am, the doors opened and the room filled with accounts. A group of bar owners, servers and wine tasting groups found their seats and readied themselves for their first taste of the Deschutes portfolio. Erick Frank, the Southern Zone Events Manager for Deschutes, lead the tasting and education portion of the morning. Alongside a brewer and founder Gary Fish, Erik brought the brand to life for the audience, described flavor profiles, the brewing process and how to serve the beer for potential customers. There was a lot of discussion about IBUs and hop varietals for an audience that was still trying to wrap their heads around the concept of beer at all. These are wine and spirits accounts. But they were attentive, asked a lot of questions, and internalized as much as they could. They were eager to extend themselves into the growing craft beer market. "We've hired Dave Kahle, a Master Cicerone, along with myself to head our entire craft team through beer training and education. All of the people handling craft beer at Wirtz have gone through a comprehensive beer training. That includes sales consultants, merchandisers and even the drivers. Over 100 people on our staff have passed the certified beer server exam, with hundreds more slated to go through the training. 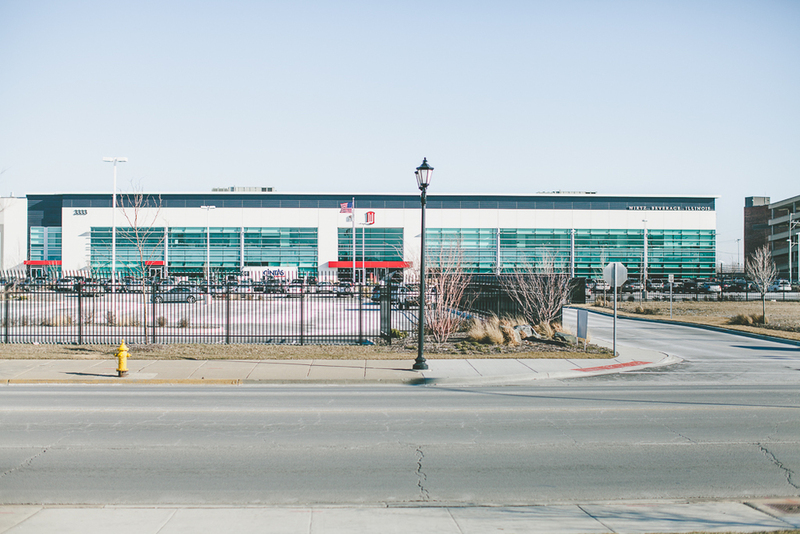 As you've witnessed, Wirtz has an amazing facility in Cicero which we plan to use regularly for connecting the retailers and consumers with brewers, brewery owners, and industry experts. Of the things we’ll work against is the preconceived impression some have of Wirtz — that we don’t know beer. We can’t wait to prove them wrong." Once most of the basics were covered, and the audience seemed to grasp both the product and the brand story for Deschutes, Gary Fish, founder of the brewery, reluctantly stepped forward to answer any and all questions about the brewery's history. Over its 25 years of craft brewing, Gary has seen a few different waves in the industry — from its founding in 1988 as a brewpub in Bend, Oregon, to it's current status as one of the countries most successful craft breweries, Deschutes has outlasted most of them. "One of the most popular questions in craft right now is 'how many breweries can we handle?'" Greg says. "Well, you're familiar with the wine industry. How many wineries can we handle? Nobody ever seems to ask that question. There are 4,000 wineries in California alone. There are 2,500 breweries in the entire country. There's a lot of nonsense, a lot of noise that goes on around us, and we just try to focus on the beer we know we should be making. We know the kind of beer we love, and we know the kind of beer our customer love. A lot of people make the mistake of assuming that craft beer is about the brewers. It's not. It's about the consumer. It always has been." Gary went on to discuss the seemingly infinite market for craft beverages in general, from wine to beer to coffee. Clearly he's not looking at craft beer as being part of the beer industry alone — it's part of something more broad and cross-category than that. "The consumer is leading. We're not the only ones. We talked about wine, but ask Howard Shultz how many coffee shops is going to be enough for Starbucks. How many coffee roasters do you have near where you live now? How many bakeries that didn't used to be there? How many local cheese makers? The consumer is demanding it. Where was Whole Foods 20 years ago.\? What makes it a good concept? Why do you or I want to shop there? It's because we want more individualized, richer experiences, particularly with the things we put into our bodies. Beer is just flowing in the same stream with all that. It's a very exciting time to be in the beer business." Clearly Wirtz thinks so as well. And landing Deschutes as their first account is no small matter. It provides a first-mover with volume, establishes credibility, and essentially guarantees that their wine and spirits accounts are going to get an immaculate craft beer product to cut their teeth on. But as Gary explains, it wasn't an easy decision. "I was a skeptic. I wasn't involved in the interview process, but you're right, beer is different. And being with a beer distributor has advantages. But a couple of things swayed me: Number one, Wirtz is a wine and spirits distributor here in Illinois, but they have beer distributorships in other states. So they know beer. They know the requirements. That's the biggest thing. Secondarily, they want to be in the beer business here in Illinois, and they're willing to use our brand to help establish a presence where they can attract other brands and create a real impact in craft beer in Illinois. And the third, and most important thing, is the quality of the people, the quality of the operation, and the quality of their commitment. I mean, just look around. It's the biggest no brainer." Wirtz has moved almost 14,000 cases of Deschutes in the first two weeks of the rollout. "We wouldn't have agreed to join the Wirtz team if we didn't hold Deschutes in such a high regard, says Jill Sites, part owner and officially the "Ambassador of Everything" at Greenbush. "We think they drew a really smart line in the sand with their move into Chicago, and we're happy to be doing the same." "Obviously someone like Greenbush has production constraints. So if we just turn the lever like we did with Deschutes, we would completely blow out of all the Greenbush product and they wouldn't be able to refill the accounts we penetrated. That's where the distributor has to be more nimble and small. It's not always the easiest thing for us to do, but we're continuing to work at it. We do it in spirits and wine all the time. There's plenty of wines that are esoteric and need to be hand-sold into fine dining accounts." "For me, it was a matter of, at first, following Scott's gut. He was ready to branch out and go in a different direction in the IL market, and I wasn't quite sure Wirtz was the proper fit for us. I listened to all he said, and wanted to see for myself. Sitting in Rocky's conference room, fielding my way through the shiny and sparkly (of which, as you know, there is a lot at Wirtz) I heard real truths about the Craft Beer Division they wanted to grow, and I became more excited about the craft beer scene in Chicago than I had felt in quite a while. So for me, Scott's gut feeling became contagious, and I felt right at home with what Wirtz was trying to do. Even though they are "old Chicago" what Danny and the crew are doing in the craft beer world is new, and they are writing their own history. I'm super excited for Greenbush to be able to help them write this particular chapter of the story." With Wirtz lined up to move their product, the Greenbush crew plans to increase production quickly. This year they're aiming for 11,000 barrels plan to open a production facility this time next year that can make over 30,000 barrels by 2014. It's an aggressive growth plan for a brewery that just put the first expansion on its brewhouse and installed its first bottling equipment. But while they deal with the work at home, their minds are on accounts in Chicago as well. "We don't want to oversell ourselves, and wind up in a terrible position, having to disappoint. It's important that we remain true to the accounts that have supported us from the beginning. Places like SmallBar, Jake Melnick's, Kuma's and Bangers & Lace need to be able to get our beer whenever they want it. They supported us through bad kegs and confusing products and threw events for us when no one knew who we were, and we care very much about that. But now we feel that it's also important to be able to service the people we've had to say no to throughout the last 2 years. Steph Izard has wanted our beer since the beginning, and she's never been able to get it. Same goes for some smaller, not necessarily "craft-centric" places. We want those places to get access, too. And as we launch package in Chicago, which will happen this spring in a very methodical and small manner, we want to make sure we take a similar approach as we always have." For breweries like Greenbush, it's about more than just the newfound capacity and access to new accounts, it's also about all the sales and marketing resources that someone like Wirtz has ready and waiting. "Wirtz has assembled this incredible team of people. They're all different, from different backgrounds, with different strengths. Working with Phil and Dave, for me, is a dream. Obviously, those two know their beer. But then having the chance to work with some of the "tool" people at Wirtz; the digital activation people, the marketing departments, the assets we have access too, that's incredible. And Danny. He's the next generation of the family for sure, and he's really made the transition so easy for us." Just this week, Wirtz announced their third craft beer partner in Vandberg & DeWulf, the American importer of forty three Belgian and Belgian-style beers from eleven countries in Europe, including Brasserie Dupont and Castelain who recently created their first-ever collaboration with Two Brothers Brewing in Warrenville, Illinois. Vandberg & DeWulf is also the company responsible for founding Brewery Ommegang in Cooperstown, NY. With Wirtz now distributing all three major competitors to big beer (wine, spirits and craft beer), they're essentially playing their own game, by their own rules. They provide an incredible power to smaller producers in the state of Illinois — major efficiencies, brand awareness and quality control — things only major industry players have enjoyed for a long time. It also positions a beverage distributor squarely against the many distribution shares that AB and Miller have in the state, and potentially creates a model for other markets around the country. If they can truly meet the needs of breweries as differently scaled and positioned as Deschutes and Greenbush, then it's really their game to lose.